today's teaser tuesday is in honor of national suicide prevention week. suicide is still the third leading cause of death for adolescents. it's the fourth for adults. for many more, self-mutilation is their way of coping. maybe it's cutting. maybe it's drinking alcohol. maybe it's drugs. the pain must stop. support love, not scars. 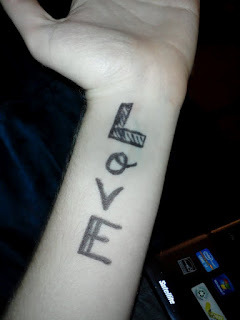 check out To Write Love on Her Arms for more information about the campaign to stop suicide. check out this essay and the sidebar links for more information about mental health. learn more about cutting / self-injury and how to get help here. I open up a paper clip and scratch it across the inside of my left wrist. Pitiful. If a suicide attempt is a cry for help, then what is this? A whimper, a peep? I draw little windowcracks of blood, etching line after line until it stops hurting. I hate this feeling. Like I'm here, but I'm not. Like someone cares. But they don't. Like I belong somewhere else, anywhere but here, and escape lies just past that snowy window, cool and crisp as the February air. To write love on her arms is an amazing organization. I'm so glad you are bringing awareness of it to so many others! They're so wonderful. If I could get just one person to check them out and get help for them or someone else, I'll have done my job. Huge fan of Ellen Hopkins! Great teasers!